Recently I was reminded of the amazing things found in Google Scholar. Loads of peer reviewed journals, primary sources and complete books! It is a great tool for locating quality resources and it is a simple way to teach students the value of QUALITY searching. Now with your Google Account you actually get a Google Scholar Account. This entitles you to browse quality journals like, the New England Journal of Medicine, the Lancet, and TONS of others in the Social Sciences. To make searching easier it also gives you the Advanced Search menu as a drop down menu from the search bar to help. It also allows you to now create your own SAVED library. The most impressive piece is the new Citations page that is created for you – simply collect your research and citations build themselves – You gotta love Google! 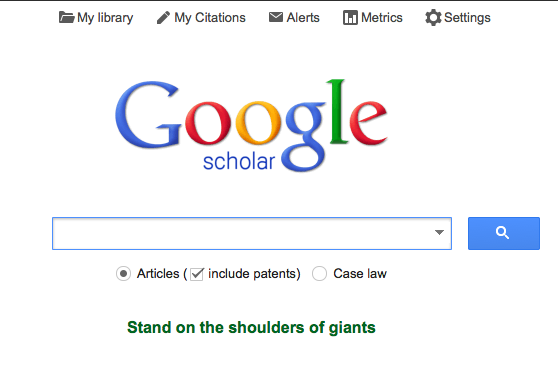 Try Google Scholar today! Previous Post: Check out the new Cicret!